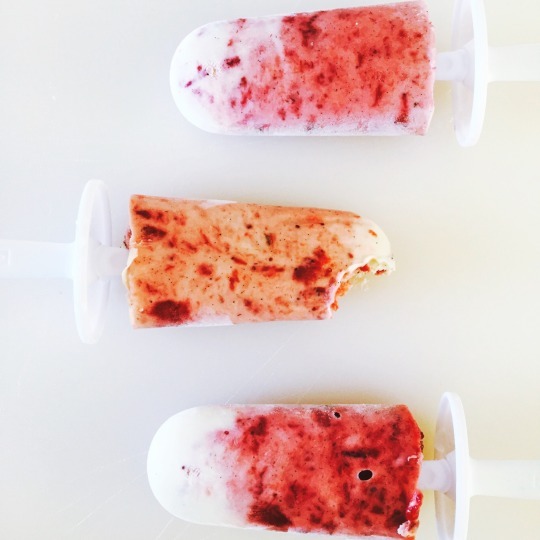 Breakfast Popsicles – A Healthy Pinch. It’s getting into triple digits here in Northern California, so making my traditional eggs or oatmeal for breakfast isn’t quite as appetizing as a frozen yogurt treat. Especially since I am up super early with the babe and will attempt to squeeze in a run before 8 a.m. Because I want something quick and need something to cool me off, I have been eating these as my default breakfast for a few days now. So, I share with you a how-to for these babies and a strong suggestion to eat popsicles for breakfast! Actually, it’s not as strange as it sounds because they’re just swirls of Greek yogurt and the Roasted Strawberry-Vanilla Bean Jam from my earlier post. I sweetened the Greek yogurt with a Honey & Sea Salt Caramel that I keep in the refrigerator for just such an occasion, however I am sure a natural sweetener of your choice would work just as well. 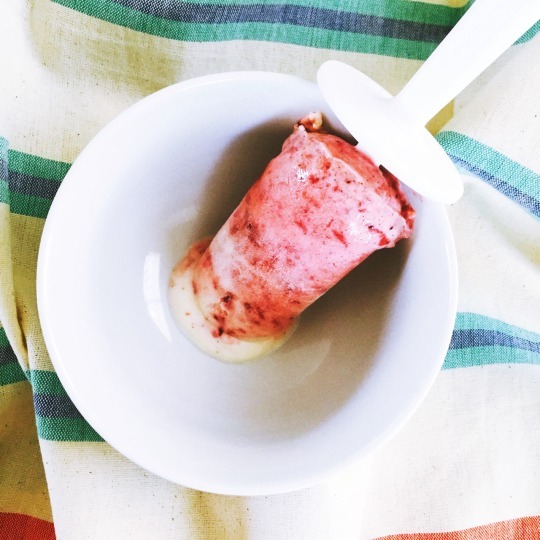 I mixed the Honey & Sea Salt Caramel with the Greek yogurt in a bowl first and then layered it with the Roasted Strawberry Vanilla-Bean Jam in my Zoku popsicle molds. Fill to the “fill line” and using a skewer, I swirled the mixture together leaving streaks of red and white. I popped the molds into the freezer overnight and the next morning I had a delicious, healthy breakfast treat! In a medium saucepan, combine honey, coconut cream, vanilla bean seeds, and sea salt and place over medium low heat. Mix thoroughly and place a candy thermometer in the pot. Heat the mixture to 300F, about 30 minutes, or until the sauce thickens greatly and turns a dark caramel color. Remove from heat, add vanilla extract and butter, and whisk together until creamy.